Hello! It's finally spring here in Northern Wisconsin. It sure took it's time getting here, but I couldn't be happier that it finally arrived. It was a beautiful evening, so I decided to take some pictures of what is in bloom in my yard. I have a hillside filled with every type of daffodil you could image. Here is a clump of little yellow ones that have a beautiful scent. 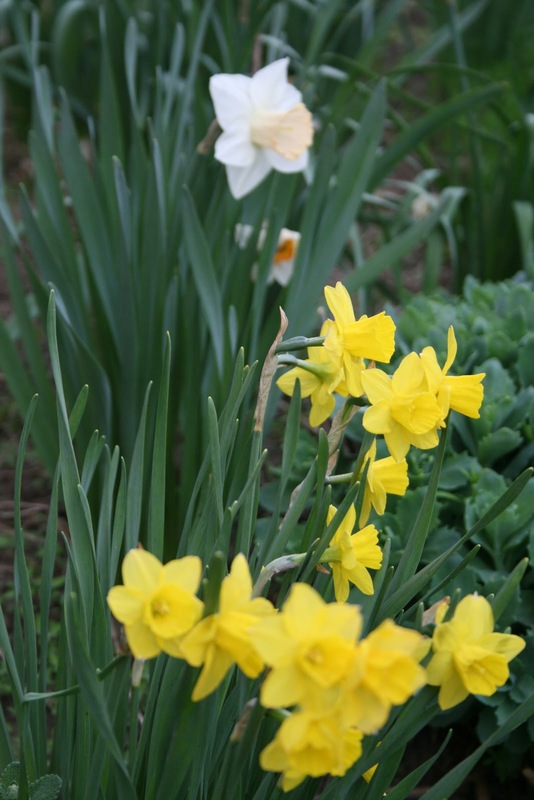 The ones below left are pale yellow with an orange trumpet and the picture to the right shows two types of daffodils growing happily along side each other. 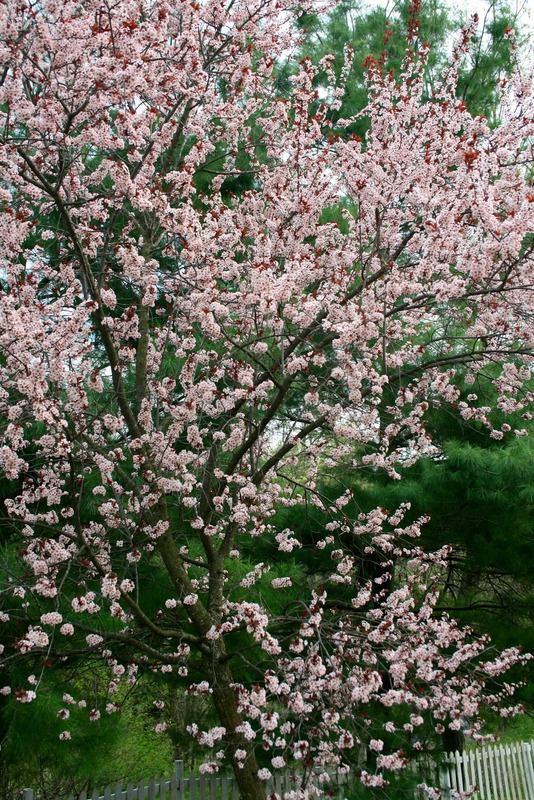 My plum tree is always the first tree in my yard to bloom. The tulips are also blooming now. 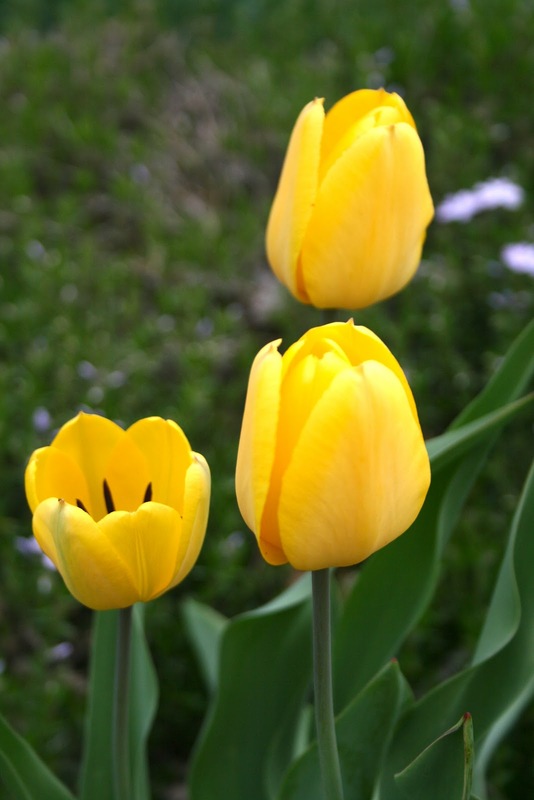 Here are some common yellow ones. 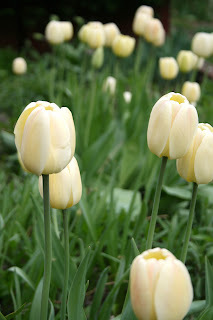 One of my favorite ivory colored tulips. And finally some cheerful, bright red tulips. And now for the finale,,.a picture of my favorite spring bird. Can you see him? He's in the branch above the feeders....that's right...a Baltimore Oriole. I look forward to the Oriole's arrival every spring. They are so gorgeous, somewhat friendly, and they have a beautiful song. I often see 7 or more at my feeders at one time. The sight of one always thrills my heart. My son said to me the other day 'They look to exotic to be in Wisconsin. They look like they should be in an Rain Forest or something." You could probably tell by that statement that we don't have too many colorful, pretty birds here in Wisconsin, so we appreciate them when they do visit. Oh so lovely images ! oh you have so beautiful tulips, love these flowers very much ! So beautiful Amy! Daffodils are my favorite spring flowers! So happy that spring finally arrived there too! Hope you'll get lots of sunny days this spring! Your flowers are beautiful!! We have Orioles here once in awhile... when the blur jays don't scare them off! Fabulous pictures of spring Amy. I love mid to late spring when all is green and colourful again.